African Domain Names: 20 Years of Internet in South Africa! 20 Years of Internet in South Africa! As amazing as it sounds, SA’s Internet is only two decades old. This weekend marks the 20th anniversary of the first packets of data that flowed over the Internet to and from SA. This Saturday at 10.44am, it will have been exactly 20 years since Randy Bush, a geek in Portland, Oregon, sent the first data packets to a computer at Rhodes University in Grahamstown. Bush was so instrumental in getting SA online that, in 2002, the Eastern Cape university awarded him an honorary doctorate. Bush sent an e-mail (see screenshot below) with the details of the test to, among others, Jacot Guillarmod and Dave Wilson at Rhodes, Fred Goldstein at the University of Cape Town (UCT) and Alan Barrett at the University of Natal. Another South African instrumental in getting the country online, Chris Pinkham, went on to help create Amazon’s EC2 “expandable elastic compute” cloud computing system. At the time, Barrett, at the University of Natal, was exploring the possibilities networked computing offered for communication and sharing of data; Pinkham was doing likewise at UCT. Both men then stumbled on one Mike Lawrie, who worked at Rhodes and who had managed to find a way to send e-mail internationally. 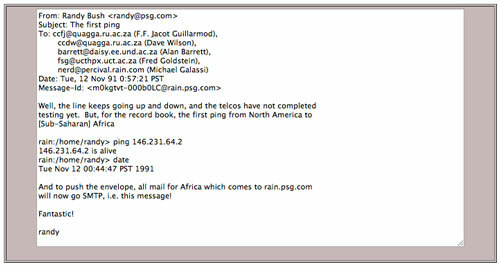 Pinkham worked under Goldstein at UCT and was asked to see if he could connect Unix systems to the university network so that they could exchange e-mail. Pinkham would eventually work with Bush in Portland, before returning to SA where he, Barrett and a man named Paul Nash in 1993 started SA’s first commercial Internet service provider, Internet Africa. Internet Africa went on to become UUnet SA, then Verizon Business and finally MTN Business. Although he’s inclined to downplay his role in getting SA online, Lawrie’s involvement was pivotal. Having set up Rhodes’s first interactive computing system he managed to persuade Telkom (then the Post Office) to install local leads into his house. With only one telephone exchange in Grahamstown, Lawrie was in what was called the “minimum radius area”, so the copper wire itself went from the university to the telephone exchange in town, then to his house. He then developed an e-mail system on Rhodes’s mainframe computer, a Control Data Cyber machine. By 1985, a committee of the country’s university vice chancellors had decided it might be prudent to network their institutions. The committee went nowhere, but Lawrie kept tinkering and eventually the network between universities and facilities like the Council for Scientific & Industrial Research began to expand. The biggest challenge, however, was connecting an unpopular country — the National Party was still in government — to the rest of the world. Despite many failed attempts to establish a link to an international network, Lawrie eventually found one that was willing: FidoNet. In 1991, Lawrie found out about TCP/IP protocols and had managed to secure a sign-on at the University of Delaware. After a great deal of wheeling, dealing and hard work he also managed to secure a leased line to Bush in Portland. On 12 November 1991, that line carried the first Internet Protocol packets from SA. The country was now online. This weekend, Rhodes University will be marking the anniversary with various celebrations.